Riding on a roller coaster is one of the most thrilling experiences that is bound to give a lot of people an adrenaline rush. While the prospect of riding on a roller coaster is exciting, it might not be the best choice for kids. Due to height and weight restrictions, some roller coasters have been known to injure children. One of the worst cases of kid roller coast ride nightmares was reported by CBS News and involved a 4-year old boy who suffered from a stroke as a result of a torn carotid artery that caused a blood clot in the brain. Investigations revealed that the rides’ movements and the effects of gravity on the child’s head and neck caused the tear. This all sounds like a horrific tale, but it does not have to be bad. Children can still get the thrills and excitement from ride on roller coasters that are specifically designed for them. This ride on roller coaster from Extreme is relatively new on the market but it looks very promising and it has some good features. The Extreme amusement park-style roller coaster’s colours are appealing and they are bound to get the kids riding in no time at all. With the help of the easy entry-car that the roller coaster is equipped with, the kids will have no hassles, and they can build their strength and coordination. The recommended age for riding is a minimum of 12 months, and the maximum load that the roller coaster can hold is 75 lbs. You will need to get bike helmets to protect your little ones as these are not included in the purchase. You will have to assemble this roller coaster from Step 2 yourself, and it will all be worth it when you see how happy the kids are at play. The Dash & Go roller coaster boasts of handles that make for extra stability and a raised seat back that gives your little one extra comfort. The ramp is equipped with wheel wells which make pushing the car back up the ramp a manageable task for the kids. The recommended age for the use of the roller coaster is 2-5 years, and the weight capacity stands at 50 lbs. Another perk with the Dash & Go roller coaster is that when it is time to pack away, the roller coaster can be conveniently stacked and stored, which saves space. What stands out about this roller coaster is its aesthetic car that is suitable for kids who are old enough to know one or two things about cars. It comes as no surprise then that the recommended age is 4 years and up, as it is around this age that children have some appreciation of cars. The ramp is very simple, and this helps direct attention to the car. Although the design is simplistic, the roller coaster makes up for all of it with the long ramp.Although no specific weight restriction is given, we can safely assume that the ramp can accommodate one kid at a time up to the standard weight for older children’s roller coasters of 75lbs. If you are looking to please your toddler with a ride on a roller coaster, check out this one from Back to Basics. Your little one will be able to ride securely with the foot and backrests available on the car and you can expect the ride to last for a long time as it is made of durable plastic.The earliest age your toddler can ride on this roller coaster is 18months, but if you are looking for something your child will grow with, then this product may not be a good idea as it has an age restriction of 3 years. Maximum weight is at 110lbs. and you will have to assemble the roller coaster yourself. 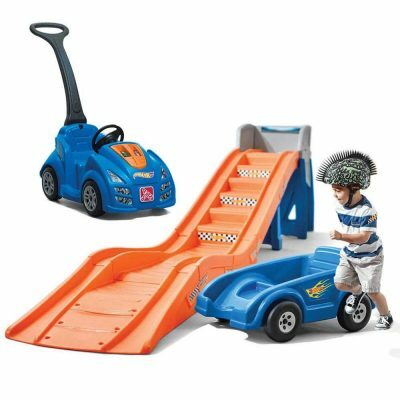 If your child is a fan of Hot Wheels, then this award-winning, well-constructed offering from Step2 is a great choice. 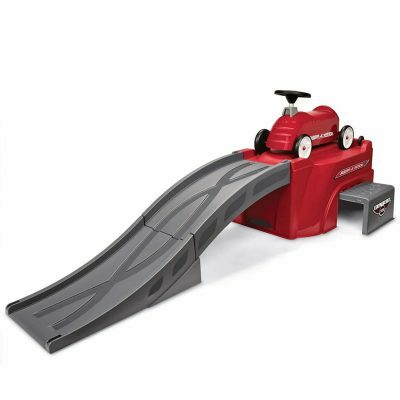 It comes complete with a secure Hot Wheels push around racer that is great for outdoor walks, and a Hot wheels extreme thrill coaster that consists of an extra 5 ft. of track that adds to the fun. 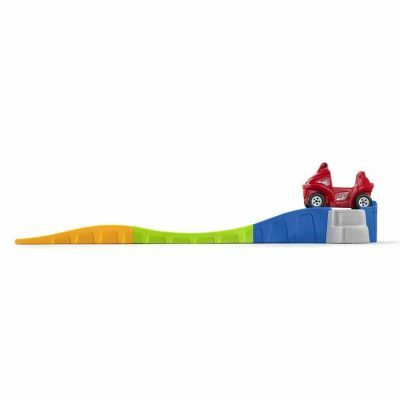 The total track is a whopping 14 ft. length which will allow kids time to enjoy the car.The minimum age for riding is 3 years, and the maximum coaster weight is 75lbs. You will need to assemble the track yourself, but this is all fairly straightforward. Lightning McQueen is the main character in this ride, and if your child is a fan, then you may have yourself a winner. 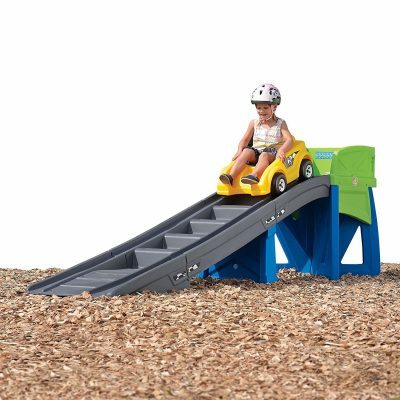 The non-slip steps are great for safely climbing to the top of the coaster, and the large-grip handle on the car makes for smoother and more secure riding. This Disney Pixar Cars-inspired roller coaster has a 7 ft. track which stays true to the theme.Weight restriction stands at 50lbs. and the age recommendation ranges from 2 to 5 years. Before the children can play, you will have to take care of the roller coaster assembly yourself. This ride-on roller coaster from Step 2 is the epitome of security and coordination-building for your child. Not only is the roller coaster equipped footrests, a high seat back, and handgrips, it also has safety rails and a non-slip ramp. Kids can easily push the easy entry car to the platform, as the wheel track has wells that make for easy pushing of the car. The roller coaster also has a simple style and colours which makes it all very appealing.You will have to purchase your own helmets and assemble the roller coaster. The maximum weight is 75lbs. but the age recommendation accommodates a wide range of ages from 3 to 8 years. 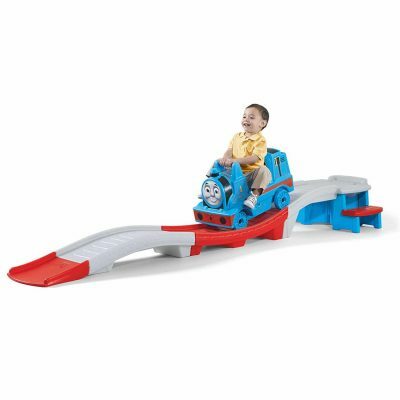 The simplicity of this Radio Flyer roller coaster makes for its ultimate sophistication. The colours are mute but the 6ft. track is exciting. Ideal for kids aged 2 to 5 years old, and with a 50lb. maximum capacity, the Radio Flyer is chic. 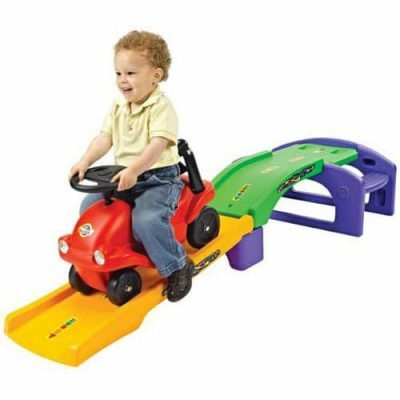 This roller coaster is more of a multi-purpose product as you can use the ramp for miniature car racing, and you can ride the car on its own, off the track.The car has footrests, and it is aligned with the ramp to secure riding. The step to get onto the platform is sturdy and makes getting to the platform easy. Once the fun is over you can conveniently store the roller coaster by detaching the ramp and car and storing them into the base of the platform. With over 1000 positive review under its belt, it is not surprising that the Up & Down roller coaster from Step2 is highly recommended. This roller coaster has pretty much everything – the colour the thrills, the comfort, and the security. The bright colours will entice the children and will make riding more fun. On the security front, there are 2 step locks that are non-slip and allow for mounting the coaster from either side. The recessed retainer well also keeps the child safe by keeping the car motionless during mounting. You also get a high back, footrests and a large handgrip.The 10ft. ramp is exciting because it is made up of two parts rather than the typical one. The age range is 2 to 5 years, and the maximum weight is 50lbs. You will have to assemble the ride on roller coaster yourself, but this requires as the roller snaps into place on its own. This review will show you the hottest ride on roller coasters on the market that have some raving reviews to back them up, and we will give you insights into what makes these rides the best. We will look at the things that make the ride on roller coasters good, including age recommendations, materials used, comfort, and safety specifications. Read on for a look at products that will excite your child while at the same time improving their coordination and balance. It is important to protect children and create safe surroundings for them when they are playing. Kids have been known to learn and sharpen their minds during play, and the products presented here are excellent for that. There is an inundation of products out there, but we hope that this review will help you select the right products when you go on to purchase a ride on roller coaster for your kid. Keep in mind your child’s preferences, and always supervise the children when they are playing. Here’s to happy ride on roller coasters rides.